JNN 03 June 2014 MADRID — Spain’s King Juan Carlos, who led Spain’s transition from dictatorship to democracy but faced royal scandals amid the nation’s near financial meltdown, will abdicate so his son can become the country’s next monarch, Spanish Prime Minister Mariano Rajoy told the country Monday in an announcement broadcast nationwide. Juan Carlos, 76, has been on the throne for 39 years and was a hero to many for shepherding Spain’s democratic and economic transformation, but has had repeated health problems in recent years. His longstanding popularity took a big blow following royal scandals, including an elephant-shooting trip he took in the middle of Spain’s financial crisis during which he broke his right hip and had to be flown from Botswana back to Spain for medical treatment aboard a private jet. The king’s image was also tarnished by the investigation of his son-in-law, who is suspected of embezzling large amounts in public contracts. His daughter Princess Cristina in January was forced to testify in the fraud and money-laundering case targeting her husband Inaki Urdangarin, an Olympic handball medalist turned businessman. She became the first Spanish royal to be questioned in court since Juan Carlos took the throne. Felipe would presumably take the title King Felipe IV. He has a law degree from Madrid’s Autonomous University and obtained a masters in international relations from Georgetown University in the United States. King Juan Carlos came to power in 1975, two days after the death of longtime dictator Francisco Franco. He endeared himself to many Spaniards, in large part by putting down an attempted military coup in 1981 when he was a young and largely untested head of state. As Spain’s new democracy matured over the years and Spain transformed itself from a European economic laggard into the continent’s fourth largest economy, the king played a largely figurehead role, traveling the globe as an ambassador for the country. He was also a stabilizing force in a country with restive, independence-minded regions such as the Basque region and Catalonia. At an emotional state funeral for the 191 people killed in the train bombings by Wahabi Terrorists, Juan Carlos and Queen Sofia slowly went row-by-row through Madrid’s Almudena Cathedral, clasping the hands of sobbing mourners or kissing them on the cheek. 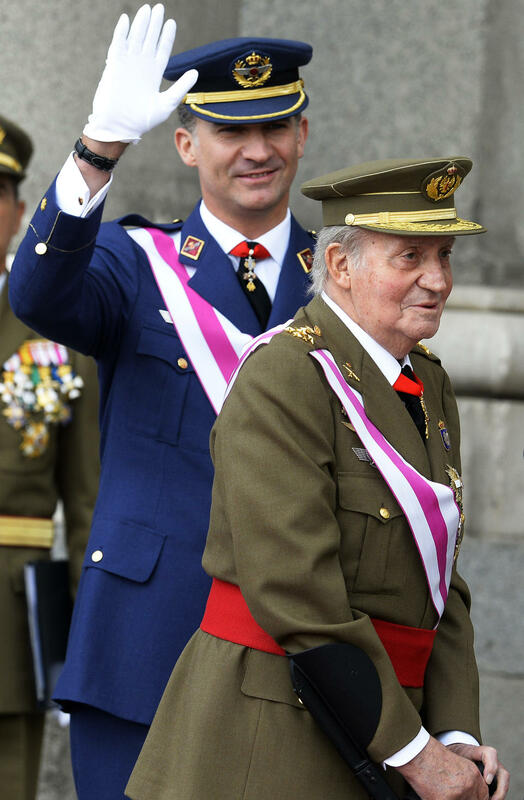 King Juan Carlos goes down a path increasingly traveled by European royalty. Last year Belgium’s King Albert handed over the throne of his fractious kingdom to his son, Crown Prince Philippe. Two months earlier, Queen Beatrix of the Netherlands stepped down after a 33-year reign in favor of her eldest son, who was appointed King Willem-Alexander. It was a break with tradition, but not as big as the decision early last year by Pope Benedict XVI to resign, a move that stunned Catholics around the world. The two royal successions in Belgium and the Netherlands have been smooth and successful. This entry was posted in Europe and tagged Crown Prince Felipe, Juan Carlos, King Felipe IV, King Juan Carlos, Spain, Spanish Prime Minister Mariano Rajoy. Bookmark the permalink.